Stop Terrorists BEFORE they Attack! Innocent Israelis are Under Attack. ATVs Stop Terrorists on the Way! Since the onset of the current wave of Palestinian terror, there have been over 1000 terror attacks against innocent Israelis. Most don’t make the news. The Palestinians’ self-declared intifada has terrorized Israelis with stabbings, shootings, bombings and car-rammings throughout Israel, with no end in sight. Yatar, an elite counter-terror volunteer force under the command of the border police was established to work hand-in-hand with security intelligence units and special commando forces to prevent and combat terror. Specialized, state-of-the-art, compact, all-terrain 4×4 ATVs that maneuver in tight spaces are Yatar’s “secret weapon,” designed to pursue and capture terrorists BEFORE they attack. ATVs are desperately needed to protect communities throughout Israel. 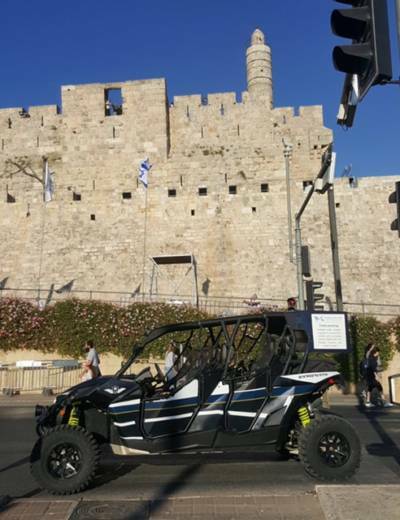 These high-tech vehicles can navigate through the narrow alleys and staircases of Jerusalem’s Old City, off-road terrain favored by infiltrating terrorists as well as along Israel’s border with enemy forces in the south and north. Since Yatar operates as a 100% volunteer unit, it is not funded by the Israeli government or the IDF. ATVs are funded entirely by supporters like you! Yatar’s volunteer combatants and vehicles are strategically deployed as a deterrent to potential terrorists. Each member of Yatar is fully trained in advanced anti-terror combat and first aid. Please join us in fighting Israel’s fierce battle against terror. Donate generously because it’s up to us to put these ATVs on the ground. Become a real partner in preventing terror attacks and saving Israeli lives.